Very Good. 602537382453 Item in very good condition and ready to ship-Guaranteed to play! ! Benedictines of Mary, Queen of Apostles; Charles Villiers Stanford; Christmas Traditional; Ephraim the Syrian;... Very Good. In very good packaging. 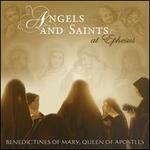 Benedictines Of Mary, Queen Of Apostles-Angels And Saints At Ephesus by Benedictines Of Mary, Queen Of Apostles.